Brass connectors production, steel fittings and connectors, special products and steel fittings for fluid systems. PEL Pintossi's specific expertise and a highly qualified team of experts play a major role in helping to develop custom projects and products. Pel Pintossi is leader in fittings for flared tube mainly used for hydraulic Brass connectors production although other non-corrosive fluids can be used. Fittings for 37° flared tube ensure a perfect seal at high pressures and are mainly used for hydraulic connections although other non-corrosive fluids can be used. They are fully interchangeable with other makes provided that they meet the norms in our catalogue. If the norms requirements and recommendations (max. operating pressure, torque, etc.) are complied with, these fittings can easily withstand stress due to vibration and sudden changes in operating pressure. 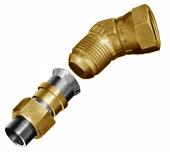 These fittings are designed for use up to a maximum working pressure of 350 bar. This type of fitting with O-ring face seal has been designed and built to ensure a perfect seal in high-pressure hydraulic systems. The O-ring seat is designed to prevent the seal from dropping out during assembly. The system is widely used for connections on industrial machinery where reliability, total safety and long life are mandatory. A support bush can be welded on to allow the use of face seal fittings even without access to a machine for tapering pipes at 180°. This type of fitting to DIN 2353 ISO 8434-1 operates on the metal seal principle. A double-sided cutting ring cuts into the pipe as the nut is tightened to create a hermetic seal and engage with the 24° taper body. The main advantage of this system is that there is no need for welding and it is easy to service and disassemble without flaring the pipes or perform additional machining. The double cutting surface reduces possible vibrations of the system and prevents the ring from slipping off. PEL fittings are the medium/heavy-duty type for operating pressures of up to 250 bar.